Push-pull solenoids are the most robust type of linear solenoids, providing a high holding force at a comparably low power input. 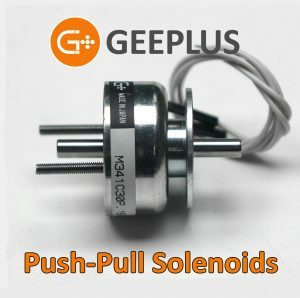 Geeplus’ push-pull solenoids incorporate an intelligent magnetic concept that allows a very high holding force at a comparably low power input. This makes them ideally suited for heavy duty applications, and those demanding low power consumption or low heat dissipation. Our Push-Pull solenoids are separated into two product groups: “Push-Pull” and “Small Push-Pull” solenoids; the difference between the two versions comes down to the size and the mounting. Small push-pull solenoids have threaded holes in the base plate, while push-pull solenoids have mounting studs. Like other linear solenoids, push-pull solenoids are on/off type actuators that develop force in one direction when energized. The return force must be provided externally, by a return spring for example.